Can you tell the visual difference between poor- and high-quality cannabis? At Leafly, we constantly receive questions from our community about how to tell the quality of buds based on photos or descriptions of their appearance alone. 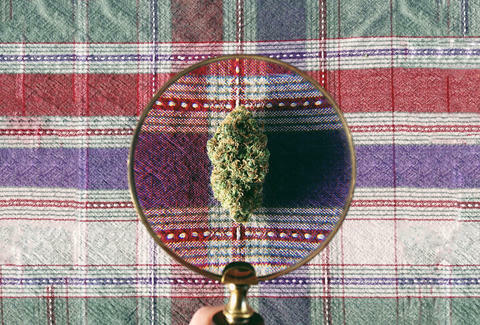 While there isn't an exact science for selecting cannabis (most of it comes down to personal opinion), there are a number of visual cues you can look for when scanning the selection of buds at your favorite dispensary. Picking out cannabis is a lot like selecting fresh produce or flowers -- you're after something that looks appealing, has a good color, and produces an enticing aroma. Additionally, you want to avoid any glaring defects like mold and mildew, insects, and discoloration. Different qualities can come from the same plant; for example, I've seen many dispensaries that separate the prized colas from the small wispy buds found on low-hanging branches (I call these "popcorn nugs"). There are many other attributes to consider when choosing the best strain for you, including price, smell, desired effects, and quantity available. A high concentration of trichomes indicates a strain with advanced cannabinoid production, which leads to potent cannabis. However, potent cannabis is not necessarily indicative of high quality -- it could be lacking the flavor profile you are looking for, or it may be a stimulating sativa when you prefer a mellow indica. Let’s check out some examples of low-, medium-, and high-quality cannabis so you can better assess the quality of the buds you're acquiring. Also called: Shwag, shake, bottom shelf, popcorn, dirt weed, brick weed, ditch weed, Bobby Brown, and more. 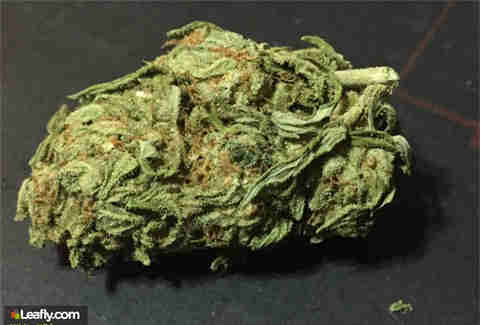 Low-quality cannabis is often transported as compact bricks, resulting in a mix of shake, stems, and compressed buds. Typically only found on the black market, shwag tends to be less colorful than your average cannabis, often more brown than green (thus the nickname Bobby Brown -- no relation to the former member of New Edition). It is dry and earthy in aroma with a taste that can be harsh and spicy, as opposed to the sweet and floral notes of top-grade cannabis. When it's not compacted into brick weed, low-quality buds tend to be light, leafy, and wispy. The concentration of cannabinoids is likely to be very low due to extreme environmental factors, like excessive heat or other variables, which cause trichomes and other crucial parts of the plant to under-develop. The harsh growing conditions typical for low-quality, improperly cared-for cannabis has a tendency to be high in cannabinol (CBN), a byproduct of degradation. Advanced levels of CBN are often attributed to poor or improper storage and handling during transportation. The effects from low-quality cannabis tend to be mellow, relaxing, lazy, and sleep-inducing (thanks to the CBN). It's not uncommon to experience headaches and other adverse side effects from poorly grown and cared-for cannabis. 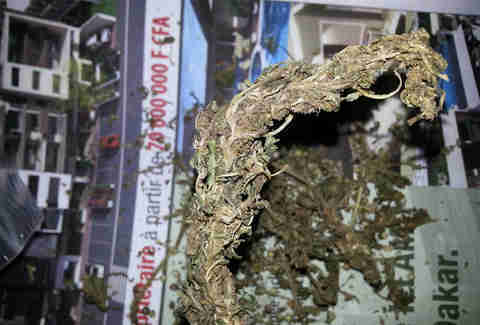 The lack of quality standards at the street level also opens consumers up to contaminated flower that has been tainted by dirt, mold, mildew, insects, and even pesticides. Also called: Mids, middle shelf, regs, Reggie, beasters, B+, work, and more. Medium-quality cannabis is where most domestically-grown U.S. cannabis lands on the quality scale. Northern states also see an influx of mids and regs from commercial Canadian cannabis, known as Beasters or B.C. Buds (though the influx is starting to dwindle now that the U.S. is shifting towards legal access). Mids can be identified by their spectrum of green hues and the presence of colorful pistils. Solid middle shelf genetics showcase purple tinge, moderate flavor profiles, and sugary trichomes. Seeds and stems are minimal-to-none, but the buds can suffer from a number of quick-to-market techniques like improper flushing of nutrients, quick curing methods, and sloppy trim jobs. Pricing for middle quality is somewhat standardized based on your region, and oftentimes bulk discounts become available when buying more than a quarter- or half-ounce at a time. Experiences with Reggies can vary, but generally if the genetics are strong, the resulting effects are potent and enjoyable. Unstable genetics or stressful environments can cause hermaphrodite plants that begin to show both sexes. These partially-formed seeds are often referred to as bananas for their elongated shape and yellow hues. Also called: Fire, primo, top shelf, loud, kill, chronic, dank, headies, flame, kine, kind, and a host of other regional names. The first thing you should know is that top-shelf buds will stand out in a sea of green. Besides the diverse spectrum of colors that premier genetics show, the amazing quality and complex aromas of truly dank weed will scream “pick me!” The nickname “loud” is used for this exact reason: the pungent smells and flavors are often too much to contain, and can draw attention to those who have it, especially when trying to be discreet. Truly outstanding cannabis has no price cap -- it can be considered a luxury item like fine wine and, depending on the laws where you live, prices can reach extreme levels. First-class cannabis will have a thick coat of sugary resin that contains the cannabinoids and terpenes, giving the plant its powerful effects and captivating flavors. Advanced potency and flavor profiles provide a diverse range of effects and individual experiences that amplify the consumer's connection to the cannabis plant. The buds themselves are typically dense and chunky, thick from advanced CO2 levels during the flowering cycle and other innovative growing techniques. Proper trimming is paramount to true connoisseurs, allowing each cola and nug to be showcased and perfectly framed. If top-shelf cannabis appears leafy, it is most often because the sugar leaves surrounding the buds are covered with trichomes too precious to discard. Seeds are extremely rare to find in the finest-quality cannabis, so if you uncover one in your stash, keep it for your own garden (providing you can legally grow in your state, of course). This article was originally published as Leafly’s Visual Quality Guide to Selecting Cannabis. For this and more reference guides, including a guide to the visual difference between cannabis quantities, visit Leafly News.